A few months ago, Louise and I posted a piece about how to evaluate nonfiction for children. In that post we described the different types of nonfiction texts (browser, specialized, concept, biography, and how-to). Some nonfiction texts delve deeply into one topic. You can usually tell those books by the pages of back matter including source notes, extensive bibliography and notes from the author. Bomb: The Race to Build- and Steal- the World's Most Dangerous Weapon by Steve Sheinkin fits into the "specialized" category. Another type of nonfiction text is the "browser." Children in my library check out a lot of browsers. They love to share interesting facts and stats with their friends as they pore over the photos and information in "browsers" such as world record books. Scholastic Discover More: Planets falls into the browser category. This book will appeal to children as soon as they open the cover. Colorful photographs and illustrations will capture their attention, and the information is presented in a manner that children who are beginning to read independently will find easy to comprehend. Scholastic offers three levels of books in the Discover More series: emergent reader, confident reader, and expert reader. 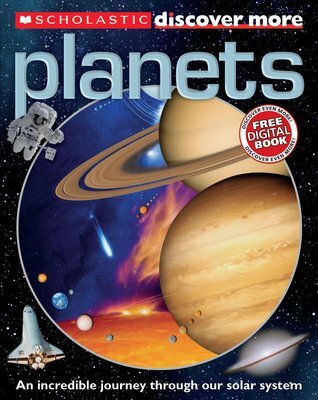 Discover More: Planets is categorized as a book for confident readers. Fans of mythology will enjoy the section that shows how each planet is named for a Roman god. A two-page timeline provides readers with important dates in space exploration. Each planet is presented on a two-page spread. The information is presented in small chunks and in the form of fact boxes and captions. The book is designed so that readers may open to any page and begin reading, which many developing readers find less daunting than reading an entire nonfiction text from cover to cover. Students in need of in-depth information for research projects may find this series limiting. However, the books will please readers who want to sit back, relax and learn about science. Each book in the series comes with access to a free digital book. The e-book companion for Discover More: Planets was impressive. The digital text focused on space machines and included close-up photographs of the Mars rovers along with photos and illustrations of space probes and satellites. Readers will enjoy testing their space knowledge with the "Quick Quiz." Scholastic Discover More: Planets has the potential to inspire young readers to check out more nonfiction books about the solar system and outer space.